Both female and male African elephant have tusks but only the male Asian elephants have tusks. 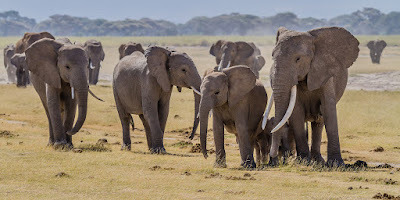 There are two types of elephant , the Asian Elephant and the African Elephant ( although sometimes the African Elephant is split into two species , the African Forest Elephant and the African Bush Elephant). An elephant's trunk can grow to be about 2 meters long and can weigh up to 140 kg . Some scientists believe that an elephant's trunk is made up of 100,000 muscles but no bones .